Fits USA Gibson Guitars. Does not fit Epiphone and Import Guitars. For Epiphone and import guitars, please check out model LPNM02-NKL in my store. 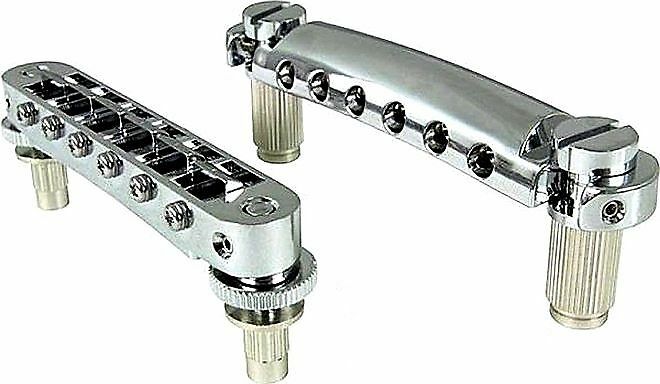 The T3BP Bridge is a locking version of the Nashville type standard small post and threaded insert as found standard on current USA Gibson Les Paul GT and Gibson SG GT models. (Same format as LP Standard & LP Custom). Pre- notched saddles for easy installation. Direct retrofit for most USA guitars without modification. The T1ZS Tailpiece is a standard style Locking Stop Bar Tailpiece. Fits most Tune-O-Matic Style guitars. The T1ZS features standard US threads that fit most USA guitars. 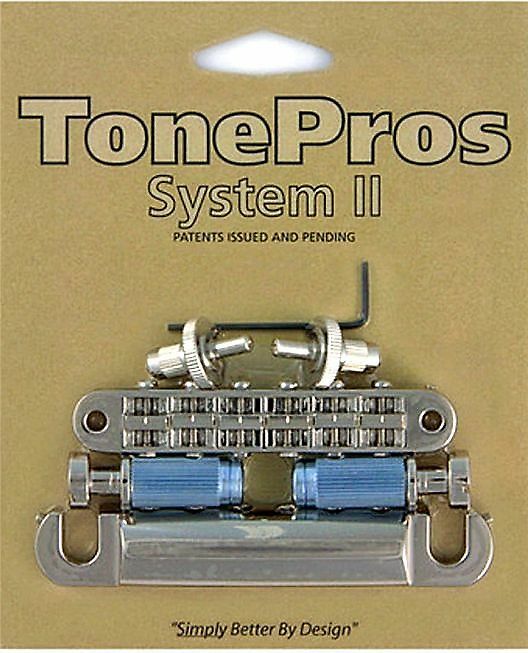 Tone Pros components completely solidify your instrument! Your System II bridge will not only just stay on, our system solidifies your bridge in place like stone! In most cases after installation and adjustment, your bridge and tailpiece will not move or “wiggle” at all. Because of our design, even play or movement in the threads is reduced so that when you adjust your action and intonation, it is set and solid. This of course improves your sustain and tonal qualities, makes harmonics “jump” out of your guitar, and causes your instrument to play and stay in tune better. Patent Issued System II Bridge with matching threaded adjustment posts. and fit most USA guitars without modification. • STUD CAP SIZE: 13MM OR .5"